Dental implants are unlike any other tooth replacement option. When compared to other tooth replacement options like bridges, dentures, and partials, implants are the more natural replacement approach. They can be used to replace one or more missing teeth. They can also be used to anchor bridges and dentures. 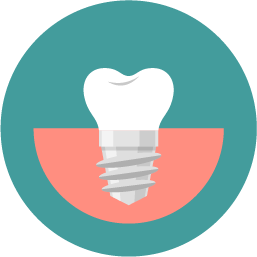 An implant is a small post made of titanium that acts like a natural root structure. The post is placed into the jaw bone. After the post is placed, time is needed for the jaw bone to grow and integrate around it. Once the bone has grown around an implant, a crown, bridge or denture can be placed on it. The placement of the implant is done by either an oral surgeon or a periodontist. The final restoration procedure (crown, bridge, or denture) is done here with Dr. Seneczko.